Are you ready to win one of OUR go to products? If you saw how many bottles of this in our home, you would know how much we love it. 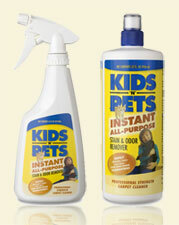 If you have kids and pets, then you NEED this product!!! It cleans up virtually anything, and we use it on our carpet, furniture, clothing-- well almost anywhere! This is one of those products we LOVE, and we shared it with you HERE. Now it is time for you to win your OWN Kids N Pets. Not only do you get a 32 oz squirt bottle, but you get a 16 oz bottle as well!!! The puppy isn't housebroken yet—I need this to clean up the floors and carpeting!! I have 3 big dogs who think the couch is their bed, I need this for those muddy paw prints! the furniture. we have a two year old and a boxer and a pitbull! I'd give this to my daughter and her family. With cats, a toddler and a baby on the way, I'm sure they would put it to good use! I have two cats at home and one gets sick lots. kristiedonelson(at)gmail(dot)com Thank you. I have a new pooch I adopted in January. Sometimes she has accidents. I would probably use it on the couch. I'd use it all over the house. I have three dogs, so plenty of mess. The living room furniture, clothes, pretty much everywhere! I would use this all over my house, but especially around the litter box. We'd use this on the carpet. I'd use it on the carpet! Pretty much every floor and surface in my house, with two little ones it would come in handy. I need to get some major stains out of the carpet.